The front panel audio header on an Intel® Desktop Board lets you connect to a front panel audio module built into a system chassis. 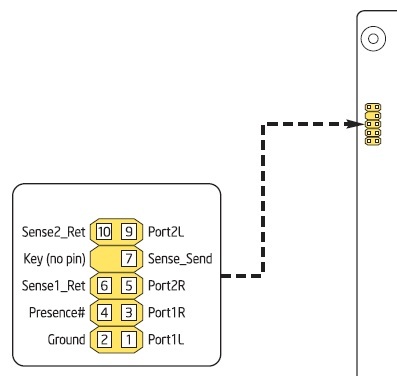 See the header pinout configuration below for connecting a chassis with Intel® High Definition Audio (Intel® HD Audio) or AC’97 (Audio Codec ’97) audio. Note HD Audio headers are pin-compatible with AC’97 chassis and connectors.